Built for Web Scale - the service must scale up and down seamlessly with your needs. 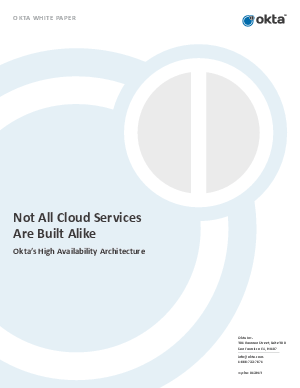 Always Available – the service must be architected for zero downtime. No maintenance windows required. Secure – the service must be more secure than anything you could build and operate on your own. Constantly Evolving – the service must deliver rapid innovation that enables new capabilities and insulates you from the constantly changing IT landscape. At Okta we take this to heart and have built the software, operationalized the processes and hired the people it takes to deliver on all of these fronts. This technical whitepaper will provide an overview of the software and operational architecture that enables Okta to run a scalable, highly available, on demand identity and access management service.